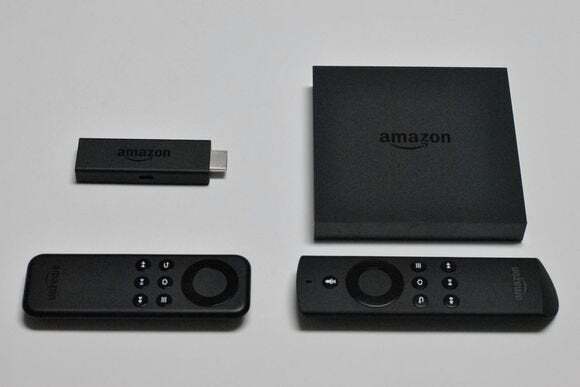 Amazon's Fire TV and Fire TV Stick offer a beautiful walled garden of content right out of the box, but one of the best things about these media streamers is how easily you can slip beyond the gates. I recently learned this for myself while researching a story on Sling TV, which until last week didn't have a proper Fire TV app. The only way to get it was to sideload the Android phone and tablet version. Start by installing the Amazon Appstore on your Android phone. Just open this link in your phone's browser and follow the on-screen instructions. You'll likely have to head to Settings > Applications (or Security) and check the Unknown Sources box before you can successfully install the store. Open the Appstore on your phone, and search for AKG Fire, from developer Gopi Adusumilli. This is a free app that lets you wirelessly sideload any apps from your Android phone, and this is far easier than sideloading through a Windows PC or Mac. 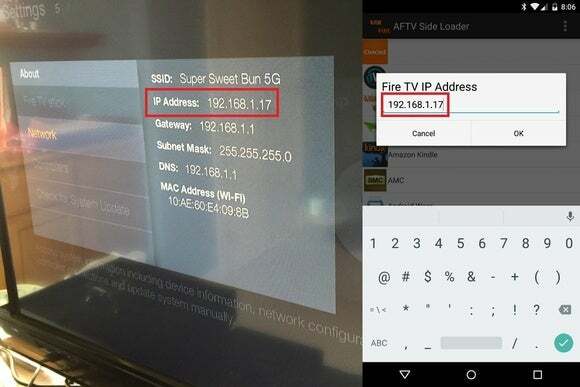 On your Fire TV, head to Settings > System > About > Network and find its IP address. Now, open AKG Fire on your phone (the app name will actually appear as AFTV Side Loader), where you'll be prompted to enter an IP address. 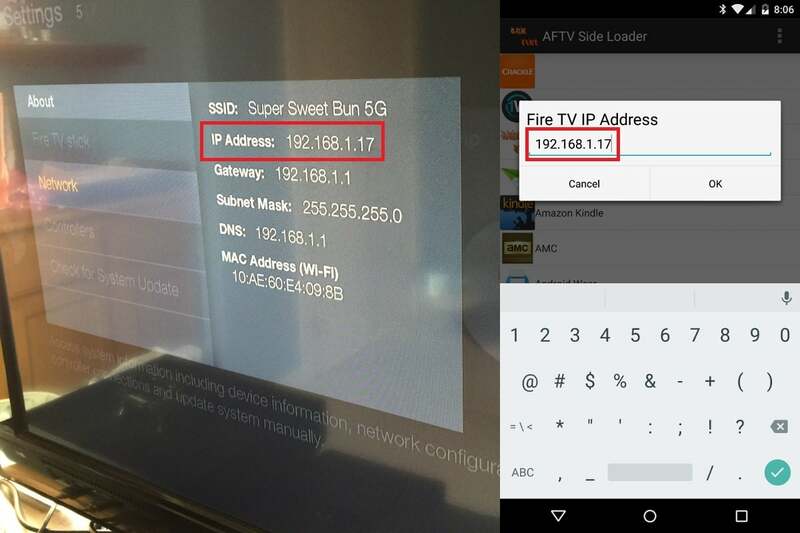 Just type in the same address that appears on your Fire TV screen. All that's left is to choose which apps to sideload. Scroll through your app list in AKG Fire until you find an app you want, then tap on it and select the “Install on...” option. The install process can take a couple minutes (and there's a pop-up ad you'll have to dismiss), so be patient. There is an alternative launcher you can install that will list all your apps in one place, but getting it to open in place of Amazon's default home screen can be unreliable. Besides, you may not want to miss out on using Amazon's interface—which bubbles lots of great Prime content to the surface—so I recommend sticking with the default launcher and dealing with the Settings menu for the handful of apps you plan to sideload. 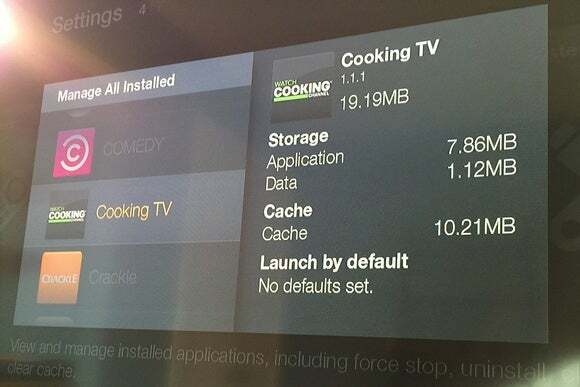 Here's the other problem with sideloaded apps: In most cases, they're designed for touchscreens and don't play nicely with the Fire TV remote. 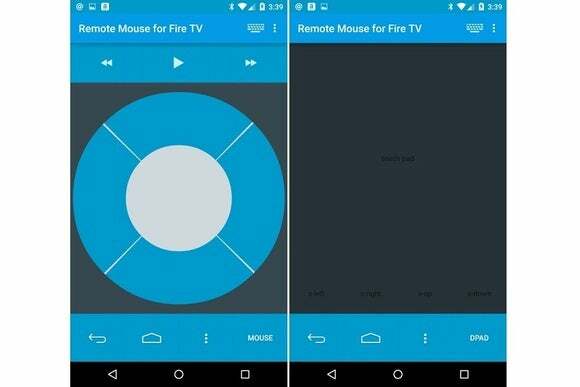 Fortunately, the $2 Remote Mouse for Fire TV app gives you all the flexibility of touch controls on the big screen. It's well-worth the money for all the extra video and music you'll be getting. First, install the app on your Fire TV, straight from Amazon's Appstore. You can find it by searching “Remote Mouse” through the main search box. Open the app, and make sure the options for “Enable the Remote Service” and “Auto start on boot up” are turned on. Now, install the app on your phone through the Amazon Appstore. You'll have to switch to the app's D-Pad mode to get through Amazon's menus, then switch to mouse mode to control your sideloaded apps. Take note of the “s-up” and “s-down” buttons near the bottom of the trackpad area, which let you scroll in different directions. I love how this app is clearly designed for sideloading: If you hit the three-dot menu button in the top-right corner, and then hit “apps,” it'll take you straight to the section of the Settings menu that has all your sideloaded apps in it. If you want hardware controls, some users have reported success with the Nyko PlayPad Pro game controller, which has a built-in mouse mode, but I haven't tried this myself. Got any other sideloaded apps that work great? Do you scoff at this whole exercise while replacing the entire Amazon interface with XMBC/Kodi? Let me know in the commends, over email, or on Twitter.